Experienced in courier , House removals , Student moves . I also collect your purchased items and deliver to you from Ebay / Gumtree etc . From parcels to boxes and to small or large light furniture . I have made many happy customers over my 10 years in this trade and i work for other reputable companies as well as myself as a freelance Sole trader . I love my job and i love when my customers are happy and satisfied when i do a great job for them . i also have 2 passenger seats for travelling should passengers wish to travel with their items to their destination when moving homes. 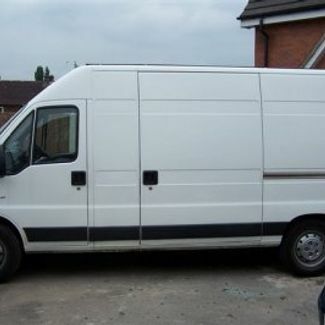 I have a large LWB Van Hightop with plenty of load space and am equipped with straps and blankets for your item to be transported safely during transit. I work on my own , so always do require a hand with loading and unloading of heavy , large or bulky items . Always on time and always give you plenty of notice before arriving with van at collection . Thank you for looking at my profile and i am all ready and happy to give you a great service . No. I only want a quote from Ronni Van & Man.